Get a single bottle of Laurent Perrier Brut Champagne. This is the signature Champagne produced by Laurent Perrier every year and is therefore their non-vintage champagne. It has a fresh, light, elegant flavour and is produced using a high percentage of the Chardonnay grape. 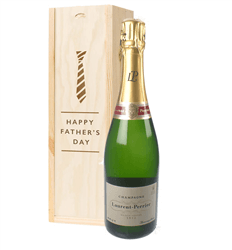 To make a special gift we present the Champagne in one of our wooden gift boxes. Established in the year 1812 when Alphonse Pierlot founded a champagne firm in Tours-sur-Marne. Champagne Laurent Perrier is among the most beloved champagne brands in the world, with its range including the popular L-Brut, and Brut Zero Dosage. Laurent Perrier is today among the most coveted champagne houses all over that own more than 100 hectares of lush vineyards. Usually a blend of three vintages, although in exceptional years released as a vintage label, Grand Siecle is the flagship of the Laurent Perrier House. Laurent Perrier only makes Vintage champagne in particularly favorable years. Recent vintages are 1997, 1999, 2000, 2002. These vintages are made from a roughly 50/50 blend of Chardonnay and Pinot Noir, with the exact ratios varying from vintage to vintage. They are the 5th largest producing champagne house in the world, with an estimated production of 7 million bottles. Laurent Perrier is most well-known for their best-selling and pioneering rose Champagne. Laurent Perrier rose champagne presented in a bottle inspired by the Henry IV century. The squat, green bottle of Laurent Perrier Rose, with its pink label, has become synonymous with quality, style, romanticism, and pure enjoyment. This wonderful pink champagne is pale salmon in colour, with precise, crisp aromas of strawberries, redcurrants, raspberries and black cherries. It has fine bubbles with persistent mousse, and prominent flavours of soft red berry fruit, with a well defined wild cherry aspect. Laurent Perrier champagne is fresh and elegant, with Chardonnay dominating, and almost no use of pinot meunier. In 2017, Laurent Perrier made the bold move to change their house champagne, replacing their NV Brut with a new style, "La Cuvee". Laurent Perrier Brut Champagne Brut non-vintage is always the expression of the House style and, as such, it is the signature champagne. Laurent-Perrier Bruts style is defined by its very high proportion of Chardonnay which provides a natural purity, freshness and elegance. We hope you are inspired by our range of Laurent Perrier Champagne Gifts.